Rich Tool Systems has everything you need to see any project through from beginning to end, regardless of what materials you're working with. Our resin fiber sanding discs are perfect for use on tough surfaces such as stainless steel and welds. You can use them for grinding, blending, deburring, removing paint from metal, and more applications requiring a powerful, durable sanding surface. 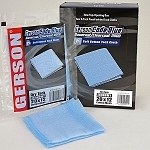 These heavy-duty sanding discs will ensure you can properly finish the hardest of jobs. We offer these sanding discs with grain composed of a heat-treated aluminum oxide, or premium self-sharpening Zirconium. The Zirconium discs self-sharpen because usage causes the Zirconium crystals to break and introduce more cutting edges into the grain. Take a look and decide which resin fiber sanding discs are right for the surfaces you'll be working with. At Rich Tool Systems, we have it all.